The fourth beta versions of iOS 9.3.3, OS X El Capitan 10.11.6, and tvOS 9.2.2 have been released to users participating in both the developer beta program and the public beta testing programs. The new releases likely offer refinements and bug fixes as the system software marches towards a final public release. No new features or major changes are known to be included in these small point release updates. Users eligible to receive the new 4th beta builds can download them now from the Software Update mechanism in the Settings apps of iOS and tvOS, or through the App Store Updates tab on a Mac. 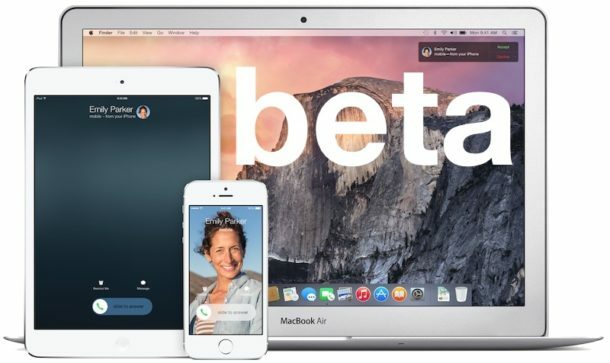 These small beta point releases are separate from the wider beta versions of the next generation Apple operating systems which are available concurrently, including the first betas of iOS 10 beta, watchOS 3 beta, macOS Sierra beta, and tvOS 10 beta. Apple often goes through roughly between five and seven beta builds before releasing a final version to the public, suggesting that the final builds of iOS 9.3.3 and OS X 10.11.6 may debut some time in the coming months or two. iOS 10 public beta is being released in July. Generally the finial version of the previous OS is released right before the next public beta. Sometimes on the same day. That’s been my experience so far. OS X beta 3 times last night and this morning and each time I had to restore with my Time Machine. I don’t know what the problem is but it is not my mini, the previous betas have been fine.